This is one of those articles that I read and think that the journalist really doesn't want to like Rachael Ray, but meets her and just can't help themselves. There's lots of little passive agressive nuggets in here. In this instance, it's David Hiltbrand of the Charlotte Observer, who interviewed Rachael Ray on the set of her new talk show (at what point do I stop calling it new?). After pointing out for the 400th time that Rachael Ray is short (5-foot-3) and a dynamo, Hiltbrand moved on to more interesting topics. Hiltbrand talks about how Rachael Ray actually samples from the food she makes on her talk show, then asks: "So why isn't this omnivorous creature twice as hefty as Oprah (whose production company, Harpo, is bankrolling Rachael Ray)?" Ouch. His answer is that she has a "hummingbird" style schedule, taping two talk shows a day after taping 80 episodes of 30 Minute Meals throughout the year. She also tapes Tasty Travels and runs Every Day With Rachael Ray. Rachael gave her usual response for how she keeps it up: "Lots of caffeine." Back in her dressing room, she's wrapped in a robe between shows. Supplicants tap on the door constantly, asking Ray to make decisions on everything from scheduling to which of her trademark Yum-O shirts to give to a guest. The show's executive producer complimented Rachael on her day-to-day involvement: "What I've learned from her," says Janet Annino, the show's executive producer, "other than how to make a few good meals, is that I like working with a talent that is so involved. She's not willing to show up and read copy." People are always asking when she will burn out. But Rachael says that what she is doing now is exciting, while previous jobs she had would certainly have lead to burn out: "I felt run-down when I was unloading 60-pound boxes of chicken in a production kitchen," she says tartly. "And I felt run-down when my mom and I were trying to cook food for 12 busloads of Canadians at a time. Everybody I know works hard," she snaps. "All the things I do here are what I would be doing for fun on my days off from those hard physical-labor jobs I've held: hang out, chat, cook, tell stories." From the Rachael Ray little-known-facts department comes this gem: "she still bears a freezer burn on her arm because as an undersized teen, she used to press against the refrigerated compartment on tiptoes to scoop ice cream at HoJo's." 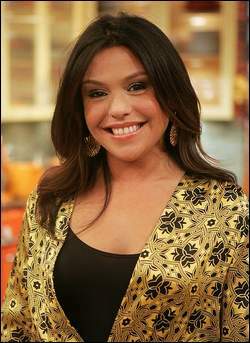 Rachael Ray's big break came in 2001, when she appeared on the today show with Al Roker and did a segment about Thanksgiving leftovers. She said the word "groovy" in almost every sentence, but still left a great impression. Only one year later, I remember watching 30 Minute Meals with my husband and he looked at me and said: "This woman is going to be a huge star." I said that if I am inspired by her and I hate cooking, maybe she will relay make it. For more details on how Rachael Ray ended up where she is, including how many people think it's her ability to stay true to herself, check out the full article here. I think so too, Anony.